In this chapter, we theorize and test a model to study the impact of agility and resilience on humanitarian supply chain performance. Here, supply chain agility and supply chain resilience are explained based on existing literature. We have undertaken an extensive literature review to build up the theory and further tested the theory using confirmatory factor analysis (CFA). The multivariate statistical analyses suggest that supply chain agility is an important property of pre-disaster performance, and supply chain resilience is an important property of the post-disaster performance, in humanitarian supply chain network. The present study attempts to further existing literature, and outlines limitations and further research directions. Dubey, R., Gunasekaran, A., & Childe, S. J. (2018b). Big data analytics capability in supply chain agility: The moderating effect of organizational flexibility. Management Decision. https://doi.org/10.1108/MD-01-2018-0119. FEMA. (2008). The disaster process & disaster aid programs. Retrieved July 16, 2013, from https://www.fema.gov/disaster-process-disaster-aid-programs. United States Congress (2000). Disaster Mitigation Act of 2000. https://www.govinfo.gov/content/pkg/PLAW-106publ390/pdf/PLAW-106publ390.pdf. Accessed 18 February 2014. World Economic Forum. (2013). 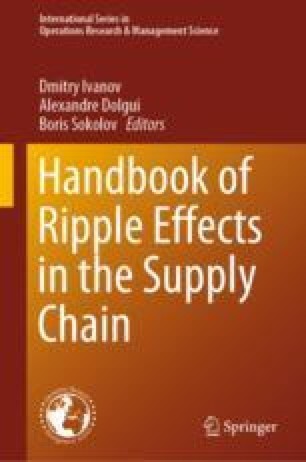 Building resilience in supply chains (REF150). Retrieved March 13, 2013, from http://www.weforum.org/reports/building-resilience-supply-chains.